An in-year ‘temperature check' of the first four months of the Neonatal Expenses fund, allowing Ministers and Boards to see how well the early stages of the scheme is functioning and to make any urgent changes. The Neonatal Expenses Fund (NEF) was launched on 1st April 2018 and is designed to help parents of premature and sick newborn babies to offset the cost of travelling to and from hospital during the early days of their baby's life and the subsistence required to allow them to spend time with their baby in order to bond as a family during these early days. Family-centred care is core to the delivery of neonatal care, ensuring that parents are partners in decision-making about their baby's care, that parents provide as much care as possible for their own babies, and that there is the opportunity for regular communication between parents and clinical staff. This Fund supports these aims through practical provision to enable parents to spend as much time as possible with their baby in the neonatal care unit. This report provides an in-year 'temperature check' of the first four months of the fund allowing Ministers and Boards to see how well the early stages of the scheme is functioning and make any urgent changes. BIiss, the neonatal charity, in its 2014 report 'It's not a game: the very real costs of having a premature or sick baby - Scotland' estimated the additional cost in Scotland parents of babies in neonatal care is £218 a week (£282 for UK), and an average extra total cost of £2,045 (£2,256 for UK). This was based on a 2013 survey that received 1300 responses in total of which 85 were from Scottish parents. These costs include items such as food, accommodation, parking charges and costs of childcare for older siblings. A family fund be set up for provision of a financial support policy for long term admission and or long distance transfer from referring unit. This should be available to parents whose baby is in neonatal care for over 14 days and/or for those travelling 20 miles or more to be with their baby. The fund should cover costs associated with accommodation, food and drink, travel and childcare. The first step should be a mapping exercise to capture unit level provision and to highlight areas of good practice. In the longer term, a new national standard should be developed for minimum provision of free accommodation, food and drink, and travel for those parents of neonates who have to travel distances. "To reduce variation, an urgent review of the approach to expenses for families of babies in neonatal care should be undertaken to develop a nationally agreed policy." In November 2017 the three regional Neonatal Managed Clinical Networks' carried out scoping work to identify the existing provision for families expenses. This scoping work showed that provision across Scotland was varied and inconsistent. Following this scoping work Scottish Government announced in December 2017 that £1.5 Million would be made available to create a neonatal expenses scheme. It was decided that the scheme should benefit all families and not just those on low income as having a child in neonatal care is a stressful and expensive time for all parents regardless of income. The in-year review gathered data from each of the 14 Health Boards on the operation of the scheme in the first four months. Health Boards were asked to provide data on the claims they had received up until 31 July 2018. This included the number of individual families claiming as well as numbers of claims for meals, parking, public transport and mileage. In total the 14 Health Boards had paid out £59,923 over the first four months to 435 different families of premature and sick babies, supporting them during the early days of their baby's life. Health Boards reported over 2800 meal claims and parents travelling over 169,057 miles by car to visit their babies. £6,410 was claimed in public transport. 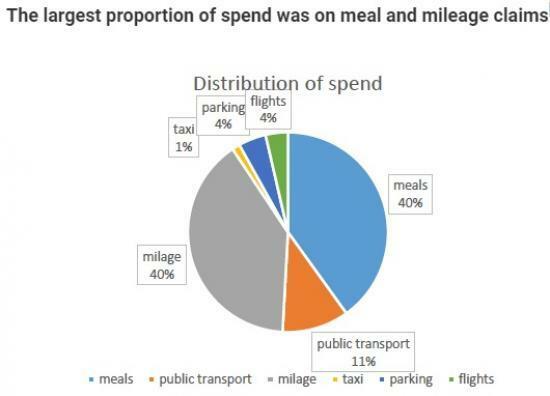 There were also 8 flights, 18 journeys by taxi and 63 claims for parking. 1359 separate claims were made of which 99.6% were approved. Health Boards were asked for feedback on the processing of the claims to identify any serious concerns that needed to be addressed immediately. The majority of Health Boards confirmed that their staff felt that the system for making claims is clear for eligible parents. The majority of Health Boards confirmed that staff within the neonatal units felt the system was very clear. Some reported that although staff were a little unsure when the scheme began they now felt confident promoting it to parents. Most Health Boards reported that their finance staff had no issues processing the claims and answering queries. Some Health Boards reported that they felt the claim form was too short and that it could be subdivided to make it clearer for parents and Health Boards. All Health Boards that have a neonatal unit confirmed that they display posters promoting the fund. Ten of the 14 Health Boards felt that the level of publicity around the scheme was sufficient in raising awareness. A full evaluation of the scheme will commence after the first year however this early review offered an opportunity for a 'temperature check' of the scheme to make any urgent clarifications or amendments if required following the establishment of the scheme and to identify the level of uptake over the early months. No changes were made to the terms and conditions as a result of the interim findings however clarification has been provided to Health Boards in relation to some points. Following feedback that the forms lacked sufficient claim space these will be reviewed to improve the layout and capacity for claims. Provision of accommodation has been raised as an area that the scheme doesn't currently provide funding for. This provision is being considered out-with the scheme as part of work under The Best Start. Posters will also be reviewed following feedback from families that the phrase 'are you eligible' may lead to assumptions that the scheme is restricted to those on benefits or with low income. We will consider any revisions to the scheme that may be needed following the end of year evaluation. Data analysis of claims: an evaluation of the spend, number of claims, type of claims, detail on who has claimed and comparison to admissions data. Survey of eligible parents: to ask about their experience of the fund, awareness and any barriers to claiming. We have worked with Bliss throughout the development of the scheme something we will continue to do throughout the evaluations and any changes that are made following this process. Bliss have agreed to promote the survey and encourage parents who have been eligible for the fund over the last year to take part in the evaluation process. Implementation of the scheme has largely gone smoothly, with most Health Boards reporting that delivery of the scheme has been simple. The low number of rejected claims indicates that parents largely understand the claims process and eligibility criteria. Spend in the first 4 months was lower than expected and it is important to understand the reasons for this. A full year evaluation will provide more details on the benefits and barriers of the scheme. In the first 4 months of operation of the scheme 435 families benefited from the fund. That is more parents who are able to spend time with their newborn during the crucial first few weeks of life, supporting family bonding, attachment and building confident parents.